I have already mentioned that I am a reformed ricotta lover, previously eschewing it in any form until I had good ricotta. 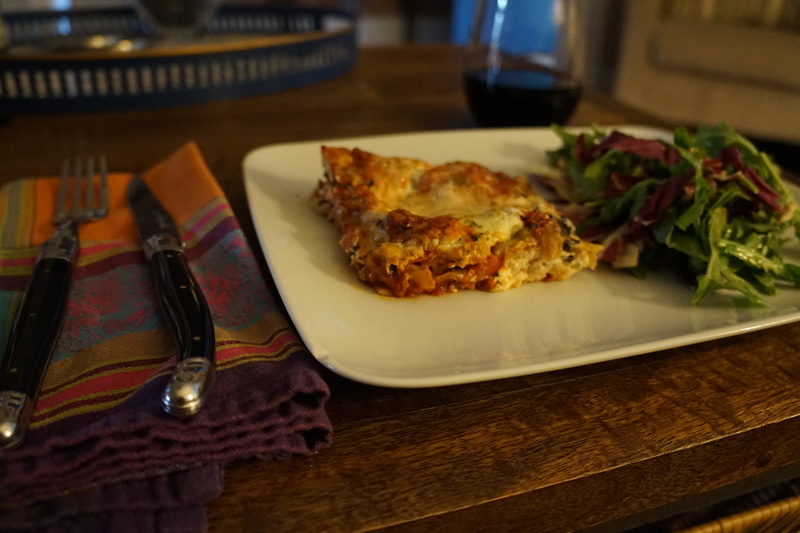 Maybe that is why I also was never a big lasagna fan as so often it was stuffed with a ton of bland crumbly ricotta. Also I think back in the 80’s lasagna was just plain boring – always the same fillings, always meat sauce with ricotta and rubbery noodles, always overcooked and heavy. I have come a long way since then, as has lasagna. Now you see more and more veggie options, using bechamel sauce, different cheeses, less pasta and more fillings. There are several recipes I like, some heavier than others but for the summer a lighter flavor profile seems appropriate. 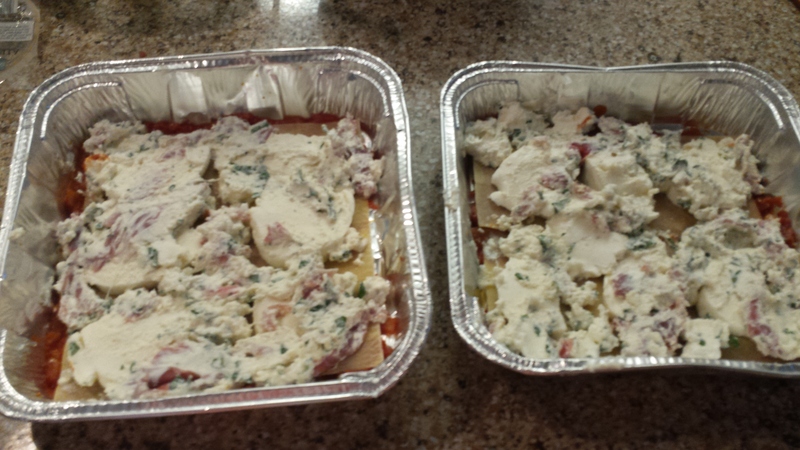 The best thing about lasagna is that you can make several in advance and freeze them. I will admit that putting them together can be sort of tedious but then just make a whole bunch at a time so you have a quick dinner any night of the week. 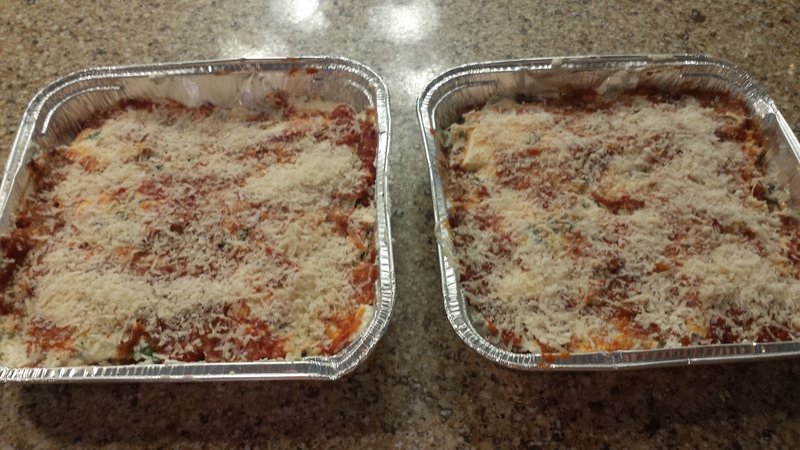 There are two schools of thought on freezing lasagna – to pre bake or not – and I fall in the not category. Assemble the lasagna, cover it with saran wrap and foil and then when you want to bake it off just leave it in the fridge over night and bake the next day. I find if you bake then freeze then bake again it can really dry out but try it for yourself and see what you like better. This recipe would make one large lasagna for about 8 people, or 2 smaller ones for 4 each. I like to serve it with an arugula salad tossed with a lemony dressing to add some sharp notes but it would also be great with sautéed escarole or a caesar. If baking right away preheat the oven to 400 degrees. In a bowl mix the ricotta, goat cheese, egg, basil and prosciutto together then season with salt and pepper. Put a 1/3 of the sauce in the bottom of the large pan or distribute equally among the 2 smaller pans, using the spoon to spread out the sauce. Then add 4 sheets of the no boil pasta on top (4 laid in the bottom of the large pan or 2 in each small pan). Then add half of the mozzarella on top of the pasta. 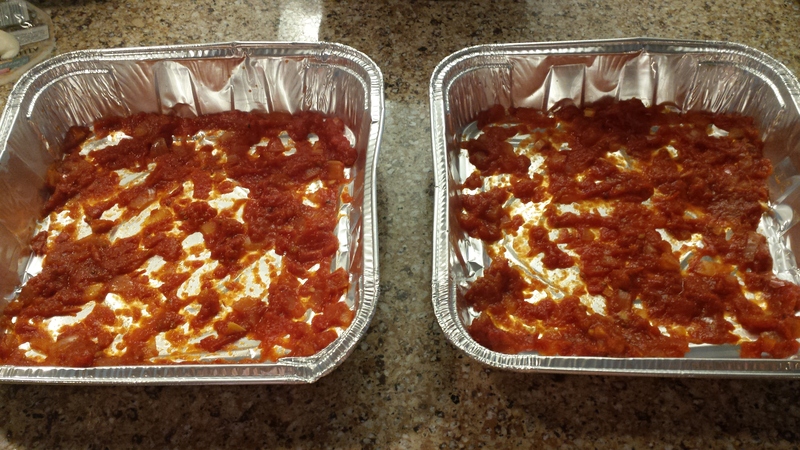 Next you add half of the ricotta mixture – don’t worry if your layers of sauce or cheese don’t cover the whole surface, once these get in the oven everything pretty much melts together. As you can see I just sort of dabbed the mixture on. Then comes another 1/3 of the sauce, 4 sheets of pasta, the remainder of the mozzarella and the remainder of the ricotta mixture. Finish it all off with the rest of the sauce and then top with the grated parmesan cheese. If you are going to freeze them cover with a layer of saran wrap (tomato sauce plus tin foil makes for a bad reaction and the saran adds an extra layer of protection from freezer burn anyway) then a layer of tin foil. They should freeze well for 6 months – take it out of the freezer the night before you want to bake it and let it defrost in the fridge. You could also just assemble these and leave them in the fridge for a couple of days (3 max) and then bake. Once you are ready to bake put the lasagna in a 400 degree oven, uncovered, for 30 minutes, maybe 40 if it’s coming from the fridge. It should be brown and bubbly on the top. Let cool for 5 minutes or so before cutting into slices. If baking right away preheat the oven to 400 degrees. In a bowl mix the ricotta, goat cheese, egg, basil and prosciutto together then season with salt and pepper. Put a 1/3 of the sauce in the bottom of the large pan or distribute equally among the 2 smaller pans, using the spoon to spread out the sauce. Then add 4 sheets of the no boil pasta on top (4 laid in the bottom of the large pan or 2 in each small pan). Then add half of the mozzarella on top of the pasta. 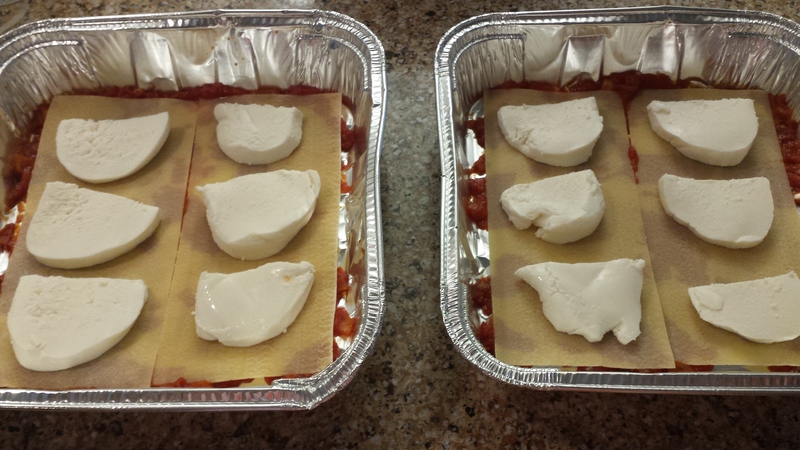 Next you add half of the ricotta mixture – don’t worry if your layers of sauce or cheese don’t cover the whole surface, once these get in the oven everything pretty much melts together. As you can see I just sort of dabbed the mixture on. Then comes another 1/3 of the sauce, 4 sheets of pasta, the remainder of the mozzarella and the remainder of the ricotta mixture. Finish it all off with the rest of the sauce and then top with the grated parmesan cheese. If you are going to freeze them cover with a layer of saran wrap (tomato sauce plus tin foil makes for a bad reaction and the saran adds an extra layer of protection from freezer burn anyway) then a layer of tin foil. They should freeze well for 6 months – take it out of the freezer the night before you want to bake it and let it defrost in the fridge. You could also just assemble these and leave them in the fridge for a couple of days (3 max) and then bake. Once you are ready to bake put the lasagna in a 400 degree oven, uncovered, for 30 minutes, maybe 40 if it’s coming from the fridge. It should be brown and bubbly on the top. Let cool for 5 minutes or so before cutting into slices. I made this recipe a few nights ago. Easy and delicious. I made this for dinner last night and it was a total winner – oh-so-easy and out-of-this-world good! It was my first Capitol Contessa recipe but won’t be my last!